The Xinjiang Mountains, part of ancient Chinese Turkistan, is a home to caves that have remained inaccessible for a long period of time. After three years of negotiation, Reza was given permission to visit the caves in order to discover the mural paintings and expose them to the public. Intended to guide one’s pilgrimage and prayers, these mural images, created between the IV and VII centuries, tell the story of Buddha: his previous lives, Buddhist mythology, symbols, characters and his bestiary. Obtaining bold colors, the contrast of Indian, Greek, Iranian, Afghani and Chinese styles, the abundance of forms and so on, these hidden treasures along the Silkroads surprise the Occidental eye with their sense of modernity. 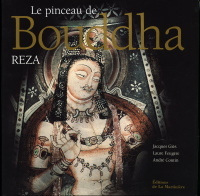 Texts written by specialists from the Guimet museum allow us to interpret them as masterpieces of art history and of Buddhism.